BungaTelur.com akan mengadakan kelas untuk mempelajari teknik decoupage di atas pinggan seramik/cermin kayu. Semua bahan akan disediakan. Hasil kerja boleh dibawa balik. Sesiapa yang berminat, sila email ke [email protected], atau sms/wa ke nombor 012 6482121 untuk maklumat lanjut. Peserta digalakkan membuat tempahan awal kerana tempat adalah terhad. I made this recently for a client. Actually I just did the background and decoupage the roses and advertised it around, someone was interested and requested to write salam greetings on the plaque. This one is sold for RM50. The size of the MDF board is 46cm (width) x 28.5cm (the highest height). This one was made last week. I just bought the raw MDF board from a supplier and I thought it would be nice to do something different than my usual style. So I used the decoupage napkin with green checkered motif. 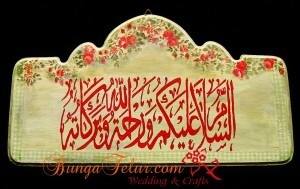 Since the floral design is in red, I did the salam greetings in red as well. The size of the board is 36cm (width) x 20cm (the highest height). This one is sold for RM35 excluded postage. If you are looking for a custom made plaque for your business, then you have come to a right place. 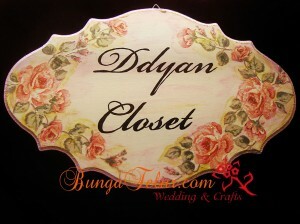 Now open for order for around RM40 for a MDF board like this. The size of the board is 14 inch in width and 9 inch in height. Postage using Pos Malaysia parcel will be around RM7. This one was made for a friend who is running a women and kids boutique. Check out her Facebook biz page here : Ddyan Closet. And this plaque was made for a nursery owner whom I get to know through Malaysia Rose Lovers Society. I still need to ask her whether the plaque could withstand the heat and humidity of Malaysian weather. Please give me at least a week to complete your order. 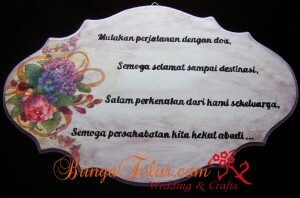 The wording and flower motif on the plaque could be customized according to your preference. Please click to view a larger picture. I made this plaque initially for a client but since it didn’t complement her business color theme, I advertised it for sale. A friend bought this and customized the wording on the plaque to be a 4-line Malay poems (serangkap pantun). 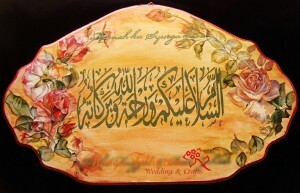 Luckily the decoupage flower motif is only on the left side, otherwise the pantun won’t fit on the board..heh! I hope the recipient of this decoupage plaque will be happy. It was my first time tracing and painting the long wording like this. Oh, BTW decoupage class for July is still available. Hurry up and sign up for 15th July, 3-5pm session. The fee is RM60, you’ll get to choose whether to learn decoupage on ceramic plate or IKEA wooden frame.